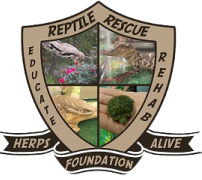 The Herps Alive Foundation is a 501(c)(3) public charity dedicated to saving, rehabilitating and caring for unwanted, neglected and abused reptiles and amphibians, and to finding new homes for them when possible, with an emphasis on educating the public about these remarkable animals. Non-profit foundation that takes in unwanted, abused and neglected reptiles either to rehome or to keep on "sanctuary" contracts. Our adoption fees are less than retail, but are set to discourage "flipping". A traveling, educational herpetology program. Licensed and insured, we offer hands-on displays, lectures, roving programs and custom-designed residencies. We have appeared on nearly 200 college campuses in 36 states and nearly 300 other venues, preforming thousands of programs for tens of thousands of people since we started as a high school project in 1976. Pricing varies with the type and location of program, starting at $225.